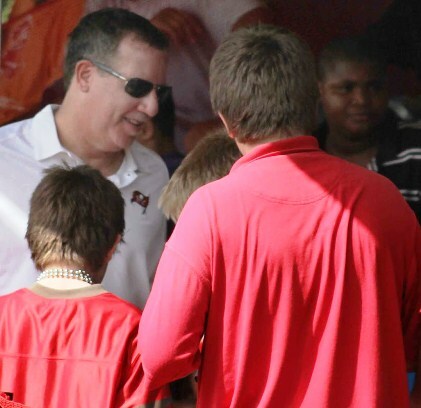 Season ticket holders may not throw rose petals when they mingle with Buccaneers co-chairman Bryan Glazer, but they certainly don’t throw rocks. The Buccaneers have the happiest fans of a 5-11 football team in the history of football. It’s a true — and official — fan-friendly dynasty at One Buc Palace. After a one-year hiatus, the Bucs are back again ranking No. 1 in the NFL in customer service among the season-ticket-holder population and among those who attend games across the league. The team announced their lofty status today as top dogs of the 2018 Voice Of The Fan Report issued by the NFL. Even after stripping fans of outdoor bleachers at training camp and price gouging some fans for premium games, the Bucs still brought home the gold. That is impressive. Kudos to Bucs COO Brian Ford and his giant team that makes it happen. 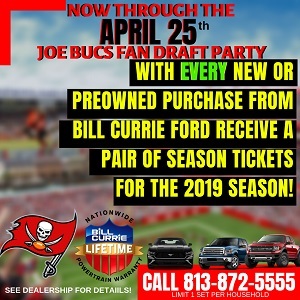 Hopefully, this is the year the Bucs must prove they have the customer service skills to please a huge increase in fans at the stadium. still winning the offseason i see….lol….nice guys come in last…. My ticket prices are thru the roof. Food and beers at game are thru the roof. Season ticket holder from Orlando for 10 years and never offered even free parking for one game. They gave upgrade to club seats one game to try out but that was to get us to purchase nicer seats. nobody wins things that are meaningless like a glazer ran the organization. put it right next to the collection of basement titles they have earned. winning is all that matters the rest takes care of itself. I’d be more impressed if some of the choir boy patrol on this site backed up their rhetoric with some community charity events but nah they rather spout off about pr dog and pony shows from bucs organization than actually do some good for the neighborhood themselves…. how about it st pete, d..r. robert, ben, pickgrin and pineapple boy when are you going to lead the JBF community charity event????? I’d be more impressed with that than athletes being driven around by PR interns to an organized dog and pony shows. Do you know when a team time period might announce new jerseys? You think it’s not a good chance if we’re going to have them this year if they haven’t said anything at this point? They want some good customer satisfaction they need to get us some cool new outfits and invite fans to OBP to throw these present one’s into a fire. Tell the Glazers the flames will be seen for miles next time you get a chance to talk them. you do understand that a uniform has never won a single nfl game…. don’t you??? What a joke of an award. How do you run out of draft beer before halftime in the entire west club?!?! Monday night football against the Steelers an usher tried to force me out of my club seats that I’ve been sitting in for 21 years for two non-club fans who sneaked into the section! A parking attendant who made me get back in my truck and move it forward one foot – then called the cops when I complained! The Glazers screwed their loyal fans like me who were stupid to sign up for 10 year seat agreements and locked us in $30-$50 per seat higher than ticketmaster! Given that we usually win the offseason, this seems fitting. Has anyone taken this “Voice of the Fan Survey”? Well…when you don;t have many season ticket holders, it is easy to take care of those you do have. As a 15 year season ticket holder, I have to say that overall, they do a good job in customer service. My representative is pro-active, they’ve offered extra tickets and upgrades on occasion. There’s always people wandering around the stadium offering to help with just about anything. The beer & food prices are what they are. They are similar to virtually every modern stadium or arena. (Actually cheaper than the Lightning). Beer and food is optional, so if you don’t want to pay the price, don’t buy it!!! They offer season ticket holders discounts on every purchase in the stadium. Overall, you can’t really complain about their customer service. Now, the product on the field, that’s a different story. This is THE funniest thing i have read all day. Kinda ironic since the actual workers at One Buc hate working for that joke of an organization. They don’t make squat, have zero perks, TEAM GLAZER treats them like they are lucky to work there. The players can’t stand the support staff like the equipment manager who is a snitch to Licht and that locker room is toxic because of it. So to read that they win ANY award the makes like its a great organization is down right hilarious. @buddy, do you have sources on the employees of One Buc Place describing what it’s like to work at One Buc Place based on what you commented? I’d be interested in reading them. Maybe Bucs fans have lower standards than the other fan bases. I mean it’s not like the Bucs and high standards are ever seen in the same sentence. The team has done an excellent job in cultivating low expectations how else can you explain how the team has a high rating for fan game day experience. I don’t believe there’s a lot of smiling faces after a typical 1 o’clock Sept-Oct seal clubbing loss. Losing football and a higher risk of cancer can’t be what’s driving the fans positive game day experience. Maybe it’s the positive self esteem boost some fans get after the cameras pan the dancing derelicts and human wrecks during commercial breaks.